With several turbocharger types and a big range of matching possibilies, we can offer a solution that fits your application and give you the most out of your engine. 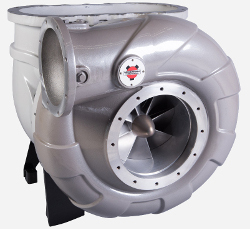 Our smallest turbocharger is a light weight model even though its water cooled. A bigger version of HS 430 with higher mass flow and slightly higher pressure ratio. Advanced design of aerodynamic parts greatly improves the pressure ratio & efficiency. Improved bearings doubles the normal operational time without maintenance. The bearing and exhaust housing is separated by heat shields and can thereby be only air cooled. A bigger version of the HS 4800 with higher mass flow. We have newly developed a bigger turbo designed for engines with air flow of 8 kg/s and up to 4200kW. It has been succesfully tested in our test cell and shall now be installed on the first engines.